With an area as big as Cape Breton National Park, you need to establish a good base of operations and settle in for a few days. I’d strongly recommend you look at Pleasant Bay, Nova Scotia. 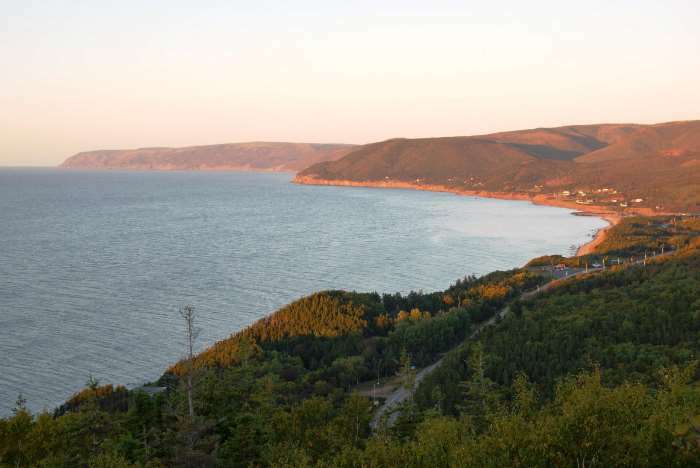 It’s on the west coast of Cape Breton Island, and within an hour’s drive of just about all of the park’s attractions. Accommodations are not plentiful, but they are affordable. 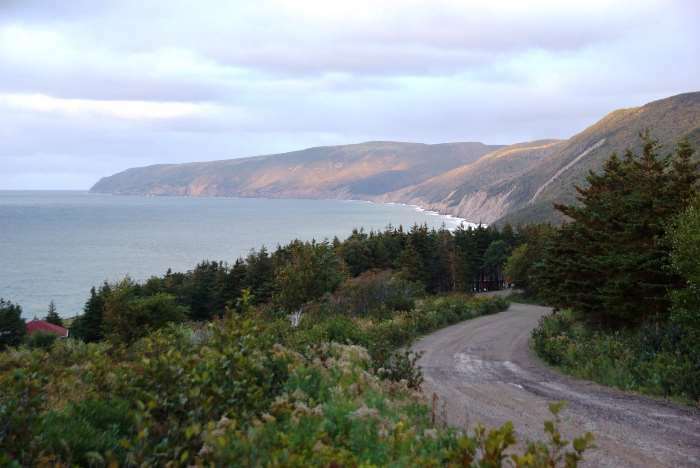 Pleasant Bay is located on the Cabot Trail, at approximately the 11 o’clock position on the loop. It’s about 40 kilometers to the park’s southwest entrance at Chéticamp, and 70 kilometers from the Middle Head trailhead on the southeast side of the park. Cape Breton’s most popular trail, the Skyline Trail, is only about 20 kilometers away from Pleasant Bay. Let’s start with where I stayed. You can’t see it very well in this freeze-frame captured by the Drivelapse camera, but it’s a cozy home along the Cabot Trail. 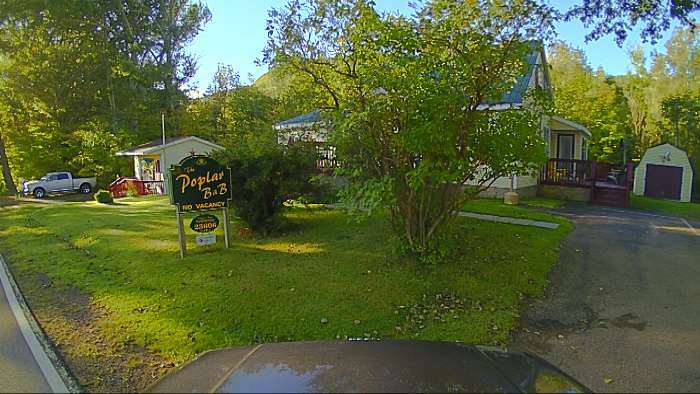 The Poplar B&B is a bed and breakfast with two rooms in the main house, and a small house next-door. The owners are long-time Cape Bretoners, and they live in the house — but their private quarters are separate from the two rooms and the kitchen/living room space shared by guests. The two rooms have their own bathroom with shower, a TV and a bed. Two people might be a little cramped, but for me, traveling alone, it was perfect. And the nightly rate was good too, around $70 (in US dollars, through Airbnb). On my first night in Pleasant Bay, I raced past the B&B, on my way to the west coast, hoping to beat the sunset. I took a turn up Pleasant Bay Road, which heads north from town, turns to dirt, then eventually dead-ends. If you go all the way to the end, you’ll pass through the community of Red River, and then you’ll pass the Gampo Abbey, a Buddhist Monastery. Tours are offered during the summer, but if you arrive after hours, you’re welcome to walk around on the grounds and take some pictures. Since I was more concerned with catching a nice sunset, I didn’t go all the way to the monastery, and while I should have returned during my stay in Pleasant Bay, I never made it back there. Instead I turned back, and found a nice place to view the coastline and the setting sun. 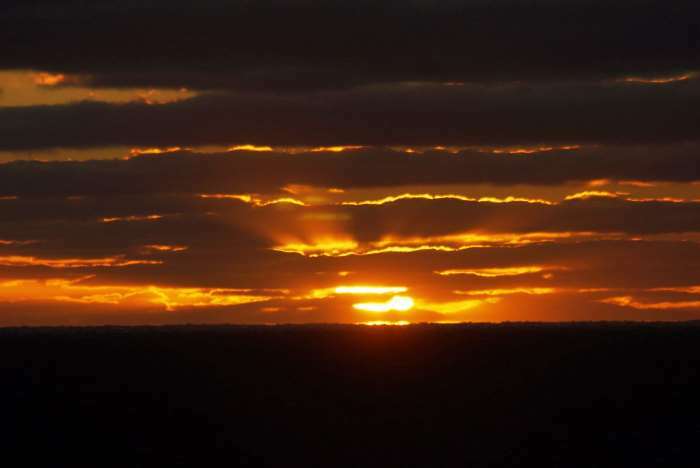 It was far from a perfect sunset, but the entire day had been much more cloudy than this, so I considered it a win. … one of the few restaurants in town. Generally, I don’t eat out when I’m traveling, for a few reasons. I usually don’t have time, and sitting in a restaurant always feels like time that could be better spent seeing something or sleeping. I usually travel by myself, and restaurants tend to seat me right in the middle of everyone, which always feels awkward. But most of all, I don’t like to spend the money. The Rusty Anchor touched on every one of those reasons. Service was terribly slow (although I did arrive late, as did a lot of other people, and there was only one server working). I was sitting in the middle of the restaurant, with crowds of people on every side. There’s little or no cell service in town, and the server wouldn’t give me the wifi password, so I couldn’t spend that very long, lonely time looking at my phone. And while the coupon helped, the food was still fairly expensive — compared to a can of soup or a peanut butter sandwich in the car. The food was okay, but not great. I ordered a spicy shrimp and pasta dish. 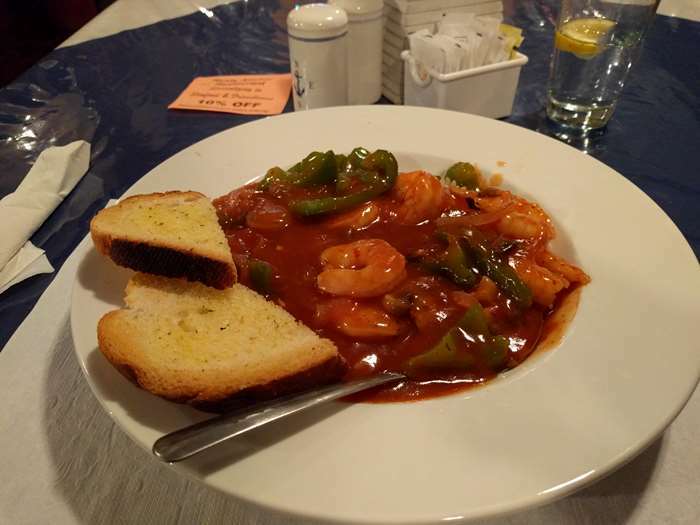 The shrimp was the best part, and there was plenty of it, but the sauce tasted like a can of tomato soup with some cayenne pepper sprinkled on top. Not quite worth the $20 Canadian, $18 after the coupon. I tried to tell myself that it was only about $15 in American dollars, and that helped. 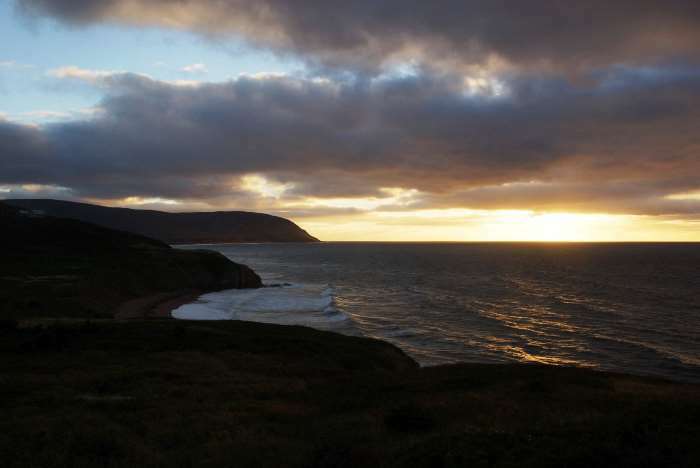 … I drove out of town, headed south on the Cabot Trail, just after sunset. The Cabot Trail quickly climbs a hill, just outside of town, and at the top you can look back down onto the road and out onto Pleasant Bay. Somewhere around the middle of that coastline is where I watched the first sunset, a couple of nights earlier. This time, I was looking the other direction. 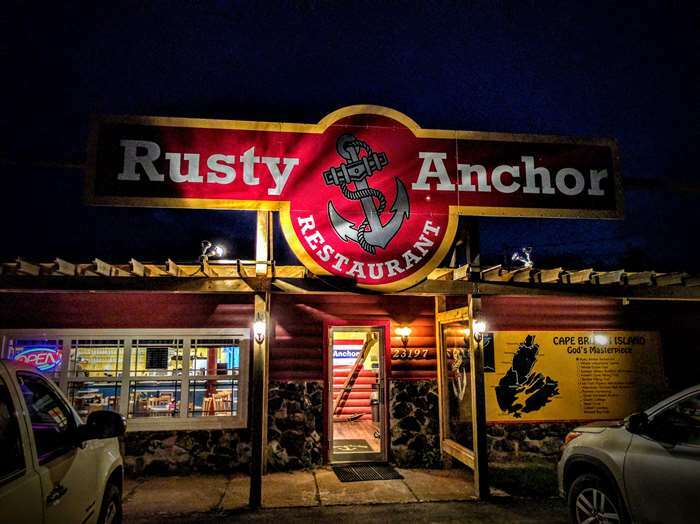 Pleasant Bay is a good place to stop, as you circle the Cabot Trail. Spending at least a couple of nights here can provide you with easy access to anything on the north end of the island, or the west side — and even the east side of the park is only about an hour away. Services are few — this is a small town — but you’ll be able to fill up your tank and get some food before heading out.